------------The Pygmy Cormorant (Phalacrocorax pygmaeus) is a member of the cormorant family of seabirds. It breeds in southeastern Europe and southwestern Asia. It is partially migratory, with northern populations wintering further south, mostly within in its breeding range. It is a rare vagrant to western Europe. 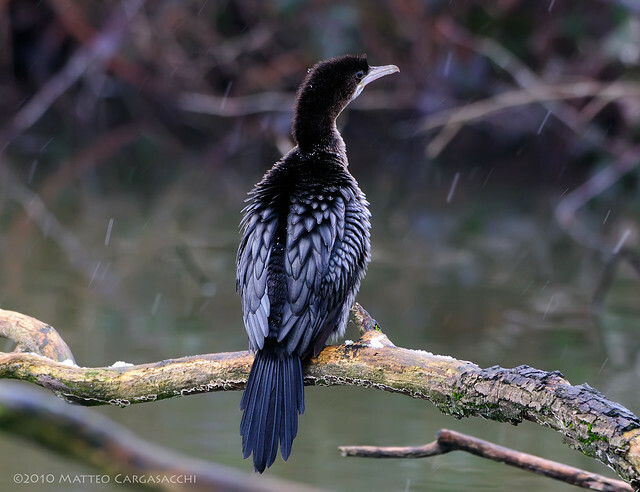 The Pygmy Cormorant breeds colonially in wetlands with still or slowly flowing fresh water in coastal deltas and well-vegetated freshwater lakes. It builds a nest of grass and twigs in a low tree or reedbed, into which it lays its 3-6 eggs. Both parents incubate for 27–30 days, and nestlings become independent after 70 days. It is a medium-sized green-glossed black bird, 45–55 cm long and with a 75–90 cm wingspan. It has a long tail and short thick bill. Adults have small white feather tufts on the head neck and underparts in the breeding season. Non-breeding birds have a white throat. The sexes are similar, but juveniles are duller and browner. This species is distinguished from the Great Cormorant and the Common Shag by its much smaller size, lighter build, and long tail. It feeds mainly on fish, often hunting in groups, and perches in trees between fishing expeditions. This is an endangered species due to the drainage and serious degradation of wetlands and their associated woodland, water pollution, disturbance, and the illegal hunting and drowning of many Pygmy Cormorants in nets. The breeding range, once much more extensive, continues to contract, and the breeding population of the species in Europe is estimated at only 6,400 to 7,300 pairs. The biggest colony is in the Danube Delta, numbering 4,000 pairs, but this seems certain to plunge due to a massive canalisation scheme, which despite the protected status of the delta, commenced in May 2004. The Pygmy Cormorant is one of the species to which the Agreement on the Conservation of African-Eurasian Migratory Waterbirds (AEWA) applies.